The CEO’s Report gained a new look in January, and this will evolve over coming months as sections are added and some of the metrics reported are clarified. One obvious change is that the TTC has reverted to reporting numbers by month rather than by four week period to align with the periods familiar to readers. Period-based reports had been intended to correct for fluctuations in month length, and the mix of types of days (weekdays, weekends) included in each period, but even then this could be thrown off by variations in the timing of statutory holidays. Any subdivision requires a bit of intelligence in the reader to recognize that small fluctuations between data points are normal, and that the trend is more important. 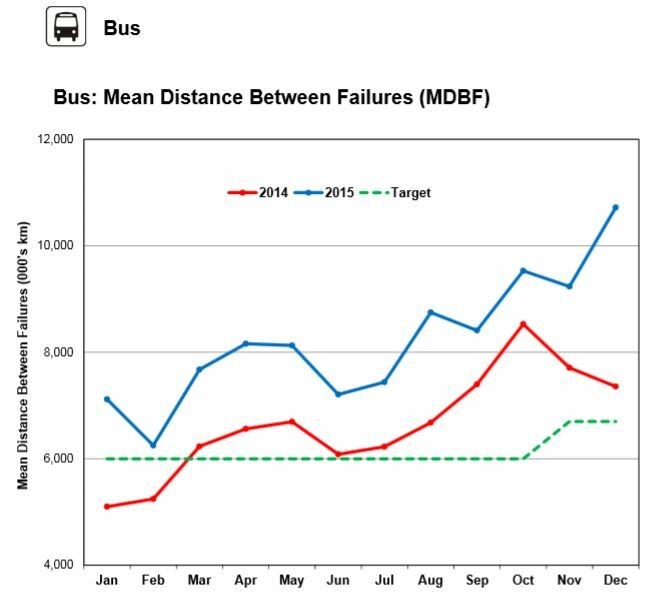 Ridership for 2015 ran consistently behind the budgeted level and, for the latter half of the year, behind 2014 results. This is a troubling long-term issue, and it suggests that the system has “maxed out” on its attractiveness to new riders. There have been some improvements thanks to a reversal of Ford-era cuts, but these are comparatively small particularly in the peak period. Capacity constraints on the subway will not be relieved soon. Although ridership and revenue were below budget, expenses were also lower, and by a greater amount with the result that the TTC showed a “surplus” for 2015 in the sense that it did not require as much subsidy as originally planned. This saving was achieved even though the scheduled service was generally greater than the budget both for regular and construction-related operations. A central factor in the attractiveness of transit service is quality, although that term takes many definitions. What a rider sees and what a digested, condensed metric presents may be quite different especially because the rider experiences the daily ups and downs (particularly the downs) of service whereas an averaged metric can hide these swings. The charts above compare the performance of the two major subway lines, 1 Yonge-University-Spadina and 2 Bloor-Danforth, for the number and length of delays in 2014 and 2015. 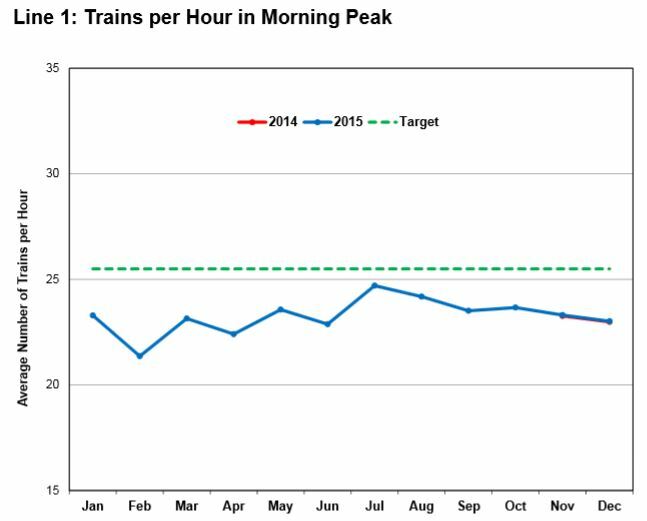 Line 1 has lower numbers for 2015 showing a definite improvement associated with better reliability on the new TR fleet. By contrast, line 2 has many more delay incidents, but generally of a shorter duration. It is important to note that if the average length of a delay remains constant, then the delay minutes will track the number of incidents. Understanding just what is going on in these numbers requires more detail than the TTC publishes. For example, has there been a change in the relative proportion of incident types, or in the average time to resolve certain types of delays. The scales of these charts do not start at zero, nor are they the same for the two lines in “delay minutes”. There is also no indication of the relative levels of service measured in, say, train hours, to establish whether one line is performing better on a normalized basis than another. Based on the values shown, the average delay consumes 2-3 minutes, and many of these are likely short enough and localized to the point they do not affect many riders. Other major delays take a long time to clear, and they affect many riders, but they are likely submerged in the averaging process. For example, if there are 2,000 delays a quarter, a few 30 minute delays will not contribute much to the totals. The real question is the prevalence of delays that are disruptive enough to affect the perception of service reliability by many riders. Another factor of interest is the throughput of trains at the peak point versus the scheduled values. The actual service provided on both lines at the peak point falls below the scheduled level quite consistently, especially on the Yonge line where long dwell times at Bloor can prevent trains from flowing through the station at scheduled rates. The effect also appears to be seasonal. Note that there is no cutback in service on line 1 for summer schedules, and with the ligher summer demand, this might indicate that the line can physically operate at close to target service levels if only there are fewer passengers. The shortfall in capacity, at its worst, is over 10%, and that is an average value over the month of February 2015 indicating that some days were even worse. Subway vehicle reliability is quite different on the two major routes, and this reflects the two separate fleets in use: the newer TR trains on line 1, and the T1 trains on line 2. 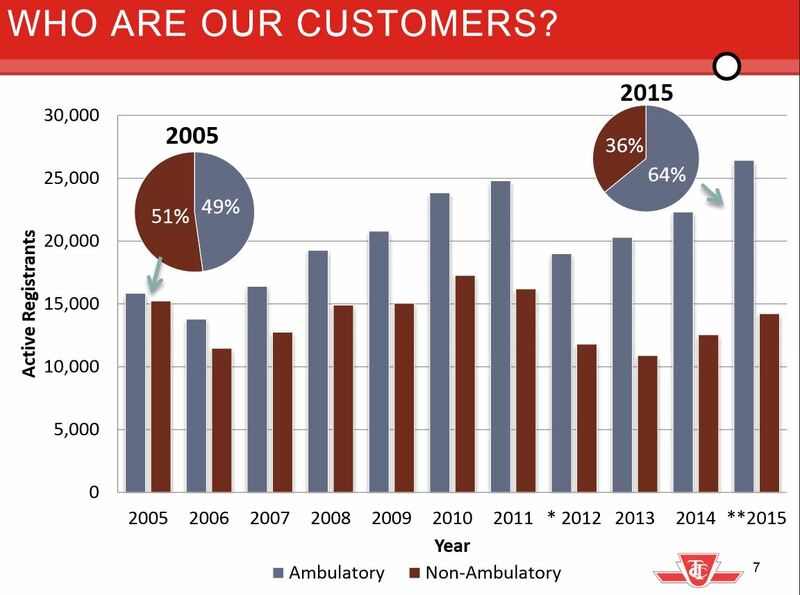 The TR trains have shown a very large improvement in failure rates through 2015 indicating that the TTC and Bombardier have gotten past the teething problems for this fleet. Even during 2014, the TRs achieved almost double the rate of the T1 fleet. Those T1 numbers, especially the two spikes, seem rather odd. The July 2015 value could be high because there was a special effort to keep all equipment in top condition for the Pan Am Games, but the spike in October by a factor of over 4x is quite unusual. Can something approaching this be achieved on an ongoing basis, or was this just a particularly lucky month? On the surface network, the TTC has shifted to new measures of service quality. “On Time Performance” measures departures from terminals within a range of +1 to -5 minutes. That is a rather generous definition especially for routes with frequent scheduled service. Vehicles can leave in pairs or even triplets, but be counted as “on time”. Short turn counts indicate the degree to which service actually arrives at its scheduled destination. There is a marked improvement on the streetcar system where both operating strategies and schedules have been adjusted on most routes. The situation for buses is not so good because only a few routes have been addressed to date. For the benefit of the TTC Board, the Chief Planner went through the presentation she has already given at various open houses and at the Executive Committee. What was quite striking in this is the degree to which several Board members were unaware of her report or of the scope of work that is already underway between the City, TTC and Metrolinx to understand how many transit proposals will fit together. Remember, these are not just ordinary Councillors or passing pedestrians in Nathan Phillips Square, but people who are supposed to have an abiding interest in transit matters and might be expected to follow developments. That said, it is good that the Board is better informing itself about this and other major aspects of the transit system for which, nominally, they hold responsibility. Although some degree of parochialism remains, if only because people talk about the part of the city they know, the idea of a network is gaining ground as the basis for discussions. The sticking points will be cost and the sequencing of projects. The study area for the RL was set to end at Danforth, and so the “little” RL was the topic of work to date. Demand projections from Metrolinx have already shown that a “big” RL running north to Eglinton or Sheppard will have a much greater benefit, but the numbers presented by City Planning to date do not get into that territory. The potential benefit of the RL is, therefore, understated leaving people like Mihevc in a position to ask why it is needed at all. Aspects of the plan continue to presume that a frequent service at TTC fares can and will be provided on SmartTrack. This assumption underpins the Scarborough transit plan, as well as the claim that a Relief Line is not required in the immediate future. However, we have yet to hear from Metrolinx whether they consider this level of SmartTrack service feasible, and the City has yet to learn how much this would cost in capital and operating dollars. From the Provincial Budget announcement, we know that there is no additional money on the table for transit, and indeed, the need for municipal participation is quite evident. Toronto will not get its rainbow network without having several billion dollars of its own on the table. How this will be funded remains a mystery in our land of “no new taxes”. Federal participation may help, and with a budget announcement in March, we will find out just what contribution they might be making. However, many of the transit schemes for Toronto are not “shovel ready” and they will not have any effect as an economic stimulus until, at least, after the current government’s mandate is finished. The best we can hope for is that spending on some projects (not necessarily transit) in the short to medium term will free up capital for other work. Board members love simplistic measures of a project’s worth, and the cost per ride often turns up as a way to evaluate proposals. This is very short-sighted because new routes have benefits beyond the immediate issue of the rides they carry, notably the release of capacity elsewhere by “relief” effects. The same riders may be on the RL tomorrow who are on the Yonge line today, but that shift creates capacity that improves service and enables new riding on the network as a whole, not just on the most recently-built part. Oddly enough, the highest possible cost for a relief line is often cited if only to scare people away from the plan, but the benefits that could flow from this spending are not mentioned. The “relief” in the “relief line” somehow doesn’t make it to the financial bottom line. The discussion turned to a debate on “who does what” in the planning arena, and the apparent takeover of primary responsibility by City Planning. A chart presented by Keesmaat gave a breakdown, but TTC Vice-Chair Alan Heisey wondered where this chart originated, and on which approvals by the TTC or Council it rested. My own recollection of this was an evolution during the Ford/Stintz era where the heavy lifting for Planning shifted away from the TTC. At the time, CEO Andy Byford seemed quite content with this arrangement so that the TTC could concentrate on its “core business” of running the railway. One can argue this point either way, and over the years neither City Planning nor the TTC have been ideal places to get “expert”, unbiased advice on transit plans. In the days when the TTC was dominant, the focus was on subways including the Richmond Hill extension and claims that there was plenty of reserve capacity on the Yonge line. LRT only forced its way onto the table through Transit City, after being downplayed and discouraged by TTC management for years. As for the City, the current plans keep hope for some pet schemes alive including SmartTrack and the emergence of Scarborough Town Centre as a major development node even if its only rapid transit link will be a subway that does not serve much of Scarborough. The elephants in the room are ignored – pet projects and godfathers at all levels of government. The Scarboro subway and SmartTrack are untouchable, and other decisions must fit around these. That is not planning expertise at work, but political clout. The Quarterly Customer Satisfaction Survey was trotted out to show what a great job the TTC is doing in making its riders happier and inspiring confidence in the system. After watching these numbers dance around for a few years, I am not convinced that we are seeing much more than seasonal variations. 2015 includes a spike in Q3 which was attributed to the Pan Am Games and the high level of customer assistance (not to mention extra service) present around the TTC system. This produces an “improvement”, but it is one that will not be sustained without a comparable effort in the future. 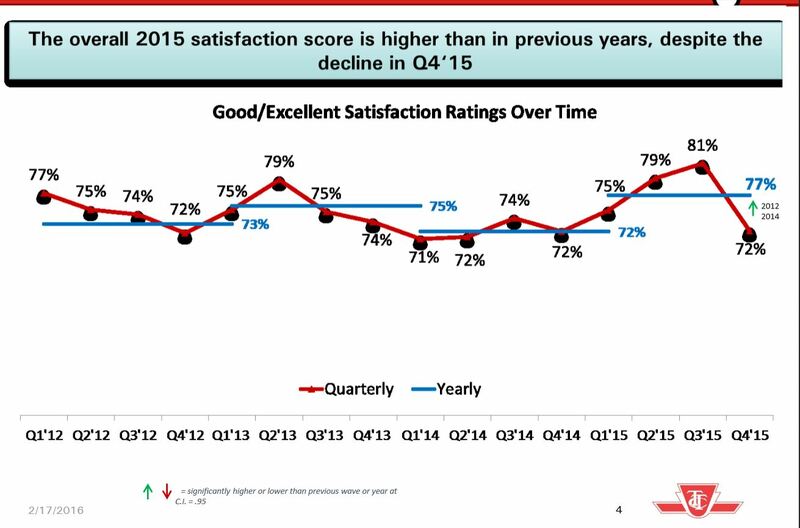 The drop back to a 72% rating in Q4’15 brings the value back to the same level reported in that quarter from 2012 through 2014. 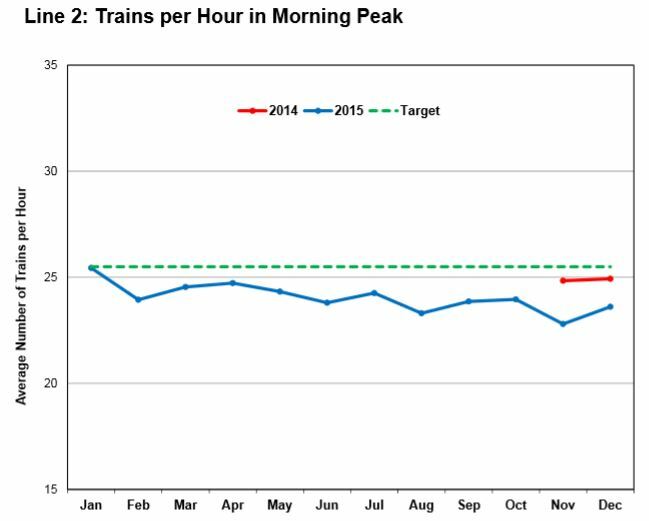 Until we see numbers for 2016, we will not know whether the comparatively mild winter gives the TTC a better satisfaction score early in this year. An obvious question is what causes the rise and fall of the overall score, and this is addressed by the “key drivers” chart. When the score rose through 2015, the perception was that trips were more attractive, but this improvement vanished with the fall survey, and it was the frequent users who know that problems are persistent, not simply a matter of one day’s bad luck, who drove this. Riders continue to have a sense that the TTC gives good value for money, and they are proud of the system, although the latter metric tends to follow the overall satisfaction line begging the question of whether these are really separate indices. Wait time remains a key issue for riders on all modes. This is no surprise as transit planners for decades have known that waits, including transfers, for a vehicle whose arrival is uncertain, produce unease among riders, and wait time “feels” longer both because it does not contribute to productive movement on a trip, and may be of unknown duration. Improving service reliability continues to be our primary focus as it is likely to increase levels of customer satisfaction in key areas, such as wait time, trip duration and crowding inside vehicles. A deputant at the meeting, who turned out to be a TTC operator, raised the long-standing problem that issues spotted and reported at the front line of the organization rarely make it through the chain of command. As an example, he cited a case where on a night car, he had given incorrect information to a passenger because the Blue Night map in the transit shelter was out of date. Andy Byford’s response was less than helpful when he talked about his program of setting up local managers with responsibility to fix things. The problem, as in any large organization, is that the issue of up-to-date customer information and signage is a systemic one, and local managers have no control over this. It should not be a Route Supervisor or Division Super’s job to ensure that route maps and other info are up to date in “their” corner of the world. There is a sense bordering on complacency that the Customer Satisfaction numbers look good overall, and this can lead quickly to that classic TTC stance that any problems are not of their making. It is tempting to say that CS numbers indicate that things are “good enough” rather than constantly trying to improve. If the big swings are seasonal, the TTC cannot do much about the weather. How the system performs under all conditions is key. Demographic changes will shift more of the population into an age bracket where the proportion of riders who cannot use the “conventional” system is higher. Provincial legislation will change the eligibility criteria for service so that more would-be users qualify for the service. The completion of accessibility throughout the TTC network will make use of conventional services, notably the subway, more attractive with Wheel-Trans providing the “last mile” service for access to trunk routes. The customer base for Wheel-Trans has shifted over the years from a roughly equal mix of ambulatory and non-ambulatory riders, to a 2:1 mix with ambulatory riders in the majority. This change implies that the proportion of riders who can use taxis rather than vans, and who might navigate part of the transit system on their own, is going up. The 2012 drop in registrants corresponds to an era when the TTC was actively paring its roster of eligible riders. This was also the era in which trips for dialysis patients were discontinued as a cost saving measure. The ratio between the two groups of riders is even more striking when expressed as trips rather than as registrants. It is no surprise that ambulatory customers would take more trips, on average, and by 2015 this accounted for almost 4/5 of the total demand. 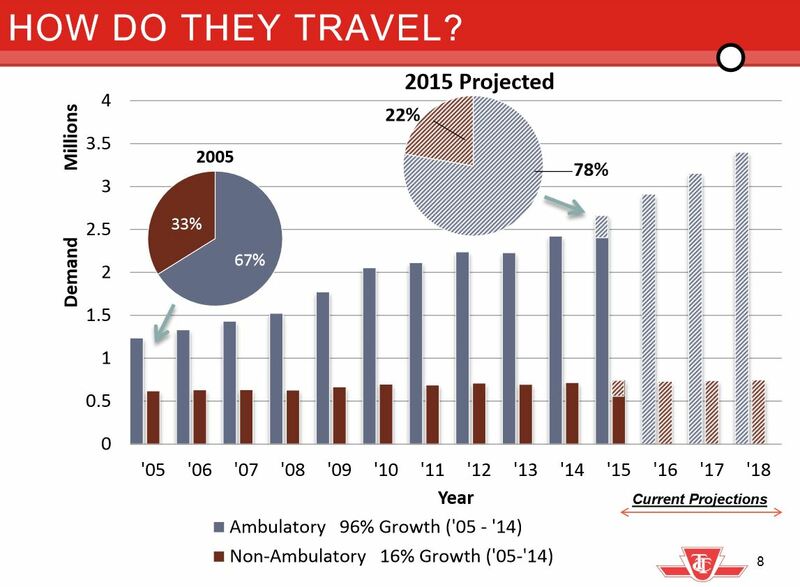 That proportion is expected to grow as non-ambulatory trip growth is projected to be relatively flat. 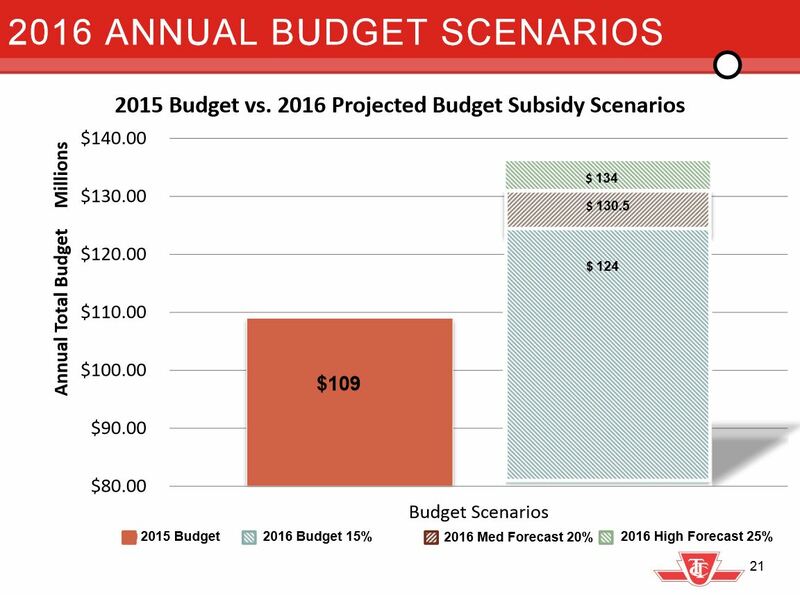 The TTC and the City of Toronto face substantial pressure for increased WT subsidies thanks to growing demand and eligibility. To the extent that this growth can be handled in less expensive modes/vehicles, the rate of cost growth can be held below the increasing demand. This and other changes are expected to boost the rate of growth for WT service, and the TTC is looking at projected rates from 15% to 25%. Compound growth at these rates will quickly increase the number of trips WT must serve. The 2016 budget was struck on the basis of a 15% increase in demand over 2015, and the subsidy at this level will be $124 million. If the rate of increase were 25%, this would add $10 million to the subsidy call against the City’s budget. This type of increase faces Toronto’s budget for each coming year, not as a one-time event. The TTC faces several challenges in shifting to a different model of service provision for WT riders. First off, there is the basic issue that a shared service involves longer rides for passengers than the distance they actually need to travel. If the intent is to use WT as a “last mile” service to take riders to a trunk route such as the subway, then wandering through multiple pickups enroute simply will not work, and this type of service will have to be much more point-to-point and “on time” to the rider’s needs. There is no point in breaking up a rider’s trip claiming they can use the subway as a bridge if the result is an unpredictable wait for the connection on the last leg. 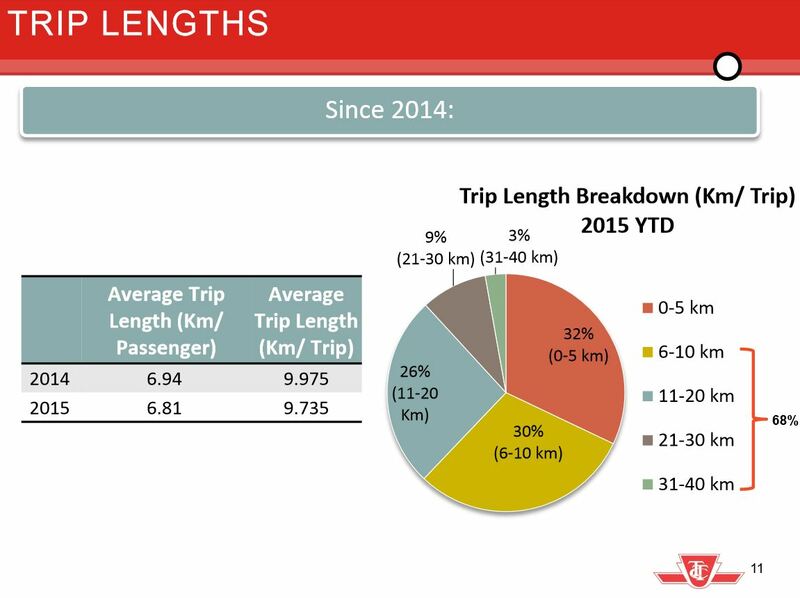 The distribution of trip lengths is interesting because it is similar to the general transit population where the average trip is in the 8-9km range. The TTC acknowledges that the short trips really cannot be offloaded onto the conventional system, especially as a three-part bridged journey, and it is simpler (and a lot faster) to simply take a rider from “A” to “B” in a single vehicle. Finally, management recommended five objectives to the Board for approval, and buried within them (particularly in the detailed discussion in Appendix I) are references to the need for organizational change. If the full system is really to be available to all riders, and the service model will see as much travel as possible on the “conventional” system, then serving those riders is not something that can be done on sufferance, or when it suits staff to “accommodate” travellers. This is a noble goal, but the real question will be how the need for “financial responsibility” will line up with actual service delivery. There are big commitments to announcement and photo-ops, but much less to actual spending. The TTC may or may not be able to keep rising costs under control by shifting demand away from the most expensive of its Wheel-Trans offerings, and in the short term this will be difficult because full system accessibility is still years away. However, if Council adopts the attitude that there is always an “efficiency” to be found, then service delivery will consist of making do with inadequate resources, a recipe for bad service, rushed and unhappy staff, and poor service to the riders. In particular, the conventional system riders should not be made to feel that they are being put out by accommodation of WT customers who can travel on regular services. When the Crosstown LRT opens, there will be substantial changes to the bus network with many new stations to which bus routes can connect. The question of what the “new map” would look like has come up before, and the map attached to this report illustrates the current thinking. Depending on the fate of the Crosstown East and West extensions, and whether they open concurrently with the central part of the line, route designs for what are now Crosstown terminals would have to be updated. Existing “Eglinton” routes would be modified. 32 Eglinton West would serve the area west of Mt. Dennis station. 34 Eglinton would serve the area where the Crosstown is underground from Mt. Dennis to Don Mills. The route name “Eglinton East” disappears. The Emmett and Trethewey branches of 32 Eglinton West would be broken off as separate routes 150 and 58 respectively. Service on Jane would be broken at Eglinton with all routes heading east to Mt. Dennis Station. A new 189 Rocket is proposed for Weston north from Eglinton to Steeles. Route 7 Bathurst is renumbered 19, and 5 Avenue Road becomes 13. Routes 51 Leslie and 56 Leaside will be through-routed as 51 Leslie to Donlands Station. They will no longer serve Eglinton west of Laird. Route 100 Flemingdon Park loses its Eglinton branch and ends at Don Mills Station. Route 54 Lawrence East is rerouted to Don Mills Station via Don Mills. It is unclear what will provide service west of Don Mills beyond the existing 162 Lawrence-Donway bus, if anything. A new 184 Rocket is proposed for Lawrence East from Don Mills Station. This entry was posted in Downtown Relief Line, Eglinton LRT, Finance, Finch West LRT, GO Transit, Jane LRT, Scarborough RT/LRT/Subway, Scarborough-Malvern LRT, SmartTrack, Transit, Waterfront. Bookmark the permalink. With several bus routes terminating or connecting at Science Centre Station (including Routes 54 and 184), but the turn-back point for many LRT trains at Laird, there’s a major disconnect between demand and operations. I still rue the decision by Metrolinx to not extend the grade-separated section of the LRT east to Don Mills Road, and allow trains to turn-back there instead. If 34 Eglinton would now serve the area the underground Crosstown portion from Mt. Dennis to Don Mills, what about Line 1 and 2? (I think that the heavy rail trains run underground.) I’m assuming that this is because elevators and escalators could go out-of-service, leaving handicapped inaccessible to what-ever trains are underground. Yet, there still no surface duplication on the underground rapid transit lines. I wonder whether they considered having one Avenue Road bus from Queen’s Park Crescent/Elm Street to Highway 401 and one Mount Pleasant bus from St. Clair Station to Doncliffe Drive. This would eliminate the need to maintain a bus terminal at Eglinton Station, and passengers could got to Yonge by one stop on Line 5. Steve: For years the TTC has resisted amalgamation of the Avenue Road and Mt. Pleasant routes. Just to be clear, what they propose is to break the 35 Jane into two routes, 35 Jane North from Steeles to Mt Dennis Station and 27 Jane South from Mt Dennis to Jane Station. It seems that the 195 Jane Rocket will not be split, although it will route through Mt Dennis Station. I wonder how much travel time that adds to the 195, and if the travel patterns make that routing worthwhile. I’m also curious to the reasons that Jane is being split, but that similar routes (41 Keele, 29 Dufferin, etc) are not. If there’s something in the ridership data or demand models that supports this then by all means, but I wonder if the TTC even thought this that far through. I can see a potential 184 Rocket coming LONG before the Crosstown opens. Lawrence is overloaded on a good day despite the express buses and turnbacks at the RT. It is one of those routes that is heavily use due to its connections to the RT and Subway and the fact it goes so far east. For years the TTC has resisted amalgamation of the Avenue Road and Mt. Pleasant routes. Just curious: why is that? Could it be political pressure stemming from the old days when the TTC brass lived in Lawrence Park and wanted a bus directly to Eglinton and Yonge (and thus the subway) or even now with seniors near Avenue Road and near Mount Pleasant who don’t want to transfer to Line 5 for just one stop? Steve: The issue whenever this came up was that the primary destination of riders from north of Eglinton was Yonge/Eglinton either for the commercial district itself or for the Yonge subway. Through routing on Mt. Pleasant would take riders “out of their way” to St. Clair, while Avenue Road does not make a subway connection until Museum Station. One other thing. I hope they’ll slightly tweak the South Leaside 88 (both ways) so that it goes up to Eglinton between Brentcliffe and Laird and thus provides a direct Line 5 connection at Laird station. I saw the map within another thread. I am confused as to a couple of the route numbers. Why would the TTC not make 7 Bathurst to 27? Why would they make it 19 Bathurst and 27 Jane South? Isn’t it easier to just add a digit in front of the 7 and keep the number still similar enough for current riders to remember? Or maybe they could rename the 77 Swansea bus to 27 from now and then let 77 take over Bathurst when Line 5 opens! I notice that it’s funny that several years ago when the streetcar and trolley coaches were taken off Rogers Road, the TTC amalgamated the Rogers service and the 48 Humber Blvd. service into one route. Well, with this configuration, the Humber Blvd. bus is back but will be known as the new Mount Dennis route!! Re: Mount Pleasant and Avenue … there are certainly longer routes (any East-West comes to mind), I would certainly endorse a singular Avenue Road service from 401 to Queen’s Park Crescent, as well a Mount Pleasant route that could terminate at Wellesley Station (via Wellesley/Jarvis/Mount Pleasant). For the record, I regularly use the Mount Pleasant service out of St. Clair station, but would happily transfer from 88 to 74 at Mt. P/St. C.
I am impressed by the solid targets of 2020 for full streetcar accessibility and 2025 for full subway accessibility; and they seem to actually be trying to achieve it. Much better than Montreal, which is probably the worst system in North America for wheelchair access. None of the “legacy” (here meaning, not built accessible from the start) systems in the US yet have a plan to achieve full wheelchair accessibility either. Steve, I wonder if you will be doing a response to the TTC’s response to the Swiftly report, which found that a large proportion of TTC vehicles don’t arrive on schedule, they arrive early. Here’s the article on the report, and here’s Chris Upfold pooh-poohing the report. Upfold’s line is that Swiftly “does not understand our system”, and claims that the reports of vehicles being early is because run numbers might shift around with operators. Or something. 1. The person doing the report does not understand the way things work. If they understood the way the TTC operates, the data would show perfect operation. 2. Whaddya expect, operation in mixed traffic, blah blah blah. I would tell Upfold to look at, for example, operation on 59 Maple Leaf. Every day, evening buses are running 3-5 minutes early when they come past my location at Ingram and Kincourt. Every. Single. Day. Unfortunately I cannot leave early. The bus that is supoosed to be at a previous timing point at 6:07 PM, and just past my stop at 6:10 PM, always goes by just after 6:00 PM and I miss it. Steve: While I think Upfold garbled his response, the basic point is that for frequent services (and that is a key qualifier), on time performance is meaningless. If a streetcar is supposed to turn up every 3 minutes, nobody cares whether it is early or late, only that they don’t see three cars every nine minutes. All of the routes Swiftly flagged as worst offenders fall in this category. However, your experiences speak to problems on less frequent routes where on time performance is an important part of good customer service. The TTC talks a good line on this, but does not deliver. Swiftly was basically marketing their app, but screwed up by failing to distinguish between situations where being on time is vital, and cases where it does not matter, but regularity is key. By overstating their critique, they devalued the important part of the message that could have been delivered. If they are counting a vehicle that is more than 1 minute early at the end of the line all that may mean is that it got 2 more green lights than on the average. If a bus sits and waits for an entire light then the riders get mad at the delay. If a street cars sits out a light all the motorists get mad. If the service is less [frequent] than every ten minutes, then being on time is more important than on a street car that runs every 3 minutes.